This is the third installment of a ten week series about dance masks from Guatemala. On September 21, 2015, I will return to discussion about Mexican dance masks. During this detour to Guatemala, this site may attract new visitors with a special interest in Guatemalan masks. I invite you to identify yourselves, using the Contact Me pull-down menu at the right end of the menu bar across the top, so that I can at least collect a list for future reference. There may be someone out there who would like to blog on that subject and, if so, I would make the list available to them or I could publish their site here. In the area of Nahuala, Guatemala there is the Patzcar dance, which does not closely resemble dances found in Mexico, although it reminds one of the Feos (uglies) in Michoacán, masked dancers who explicitly demonstrate bad or inappropriate behavior. Similarly, in Ritual Humor in Highland Chiapas, Victoria Bricker described the “Grandfathers,” masked dancers in Chamula whose behavior was deliberately clumsy and ill considered. In the Patzcar dance there is a Patrón (a European who is the landowner or overseer, the “Boss”) and his wife, La Patrona; they wear masks that are formal and distinctive. Those masks are usually painted but occasionally stained. 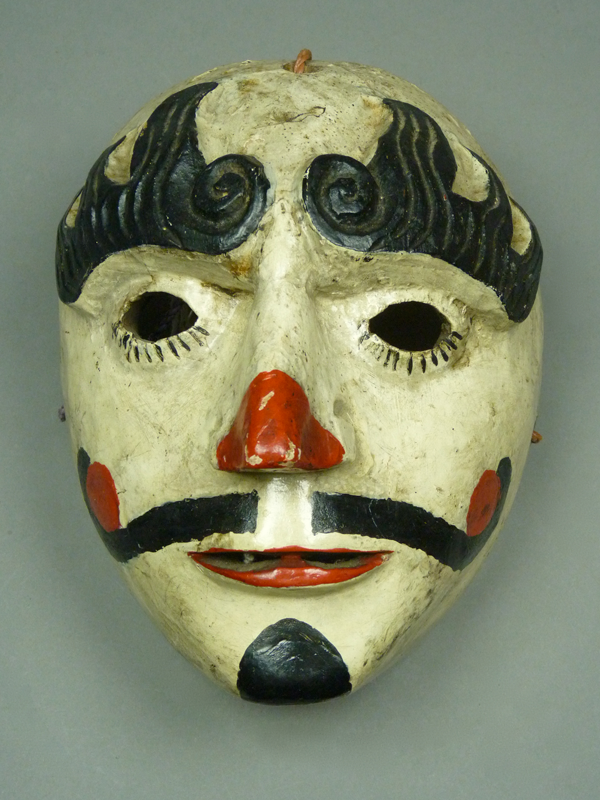 Here is a classic Patrón mask, with swirling relief carved eyebrows. We saw similar eyebrows on a Patron mask from Suchiapa Chiapas that was used in the Parachicos dance (see my 6/29/2015 post). I purchased this mask from the Cavin Morris Gallery in 1994. It had been collected in Nahuala. Last week I introduced you to the dance masks of Guatemala, noting that Chiapas and Guatemala share Mayan roots and that Chiapas was part of the Intendancy of Guatemala during the period when the present areas of Mexico and Guatemala were under Spanish rule. Because these two areas were so closely related for so long, we find that their dances and masks have some overlapping features that are otherwise uncommon in other Mexican states. 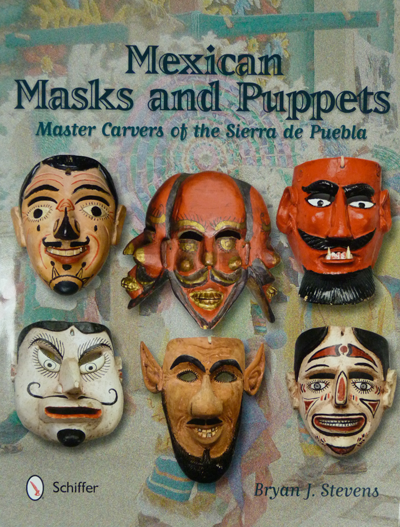 An obvious example is the popularity of monkey masks in these two regions, compared to the traditional scarcity of those masks elsewhere in Mexico. I mentioned that monkey masks are used in many different dances, including the Deer dance. 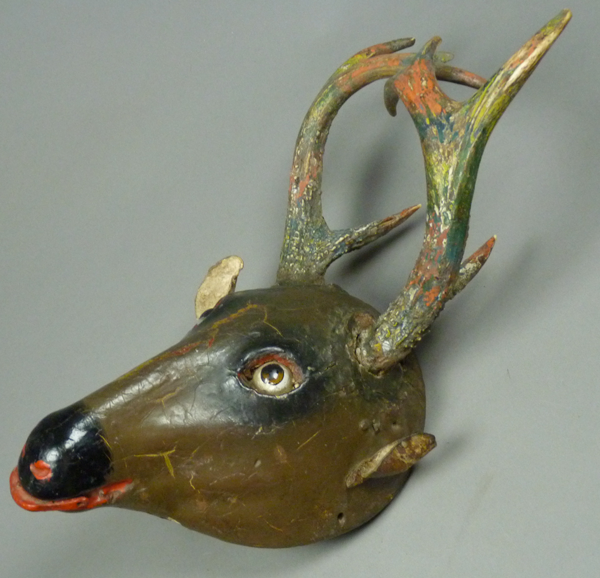 Other masks from that dance will be the subject of today’s discussion and I will begin with a beautiful old Venado (deer) mask. I had been told that it was from Alta Verapaz, Guatemala. However, Jay Vannini, a collector of Guatemalan masks who lived in Guatemala for forty years, tells me that it is more typical of Quetzaltenango or Totonicapán. I bought this lovely Venado mask and the trio of cats that follow in 1994, from the Cavin Morris Gallery. These deer masks are worn on the top of the dancer’s head. Consequently the back of the mask has heavy contact with the natural oils in the wearer’s hair, resulting in a very dark patina. In last week’s post (July 6, 2015) I included a Monito (little monkey) mask from San Fernando Chiapas that performed with a Tigre in what appeared to be a precontact dance. The masks of Chiapas and Guatemala are closely related as I will later explain, so in today’s post we will examine Monkey masks from Guatemala that perform in a variety of dances, to initiate a series of posts over the next ten weeks about Guatemalan masks. 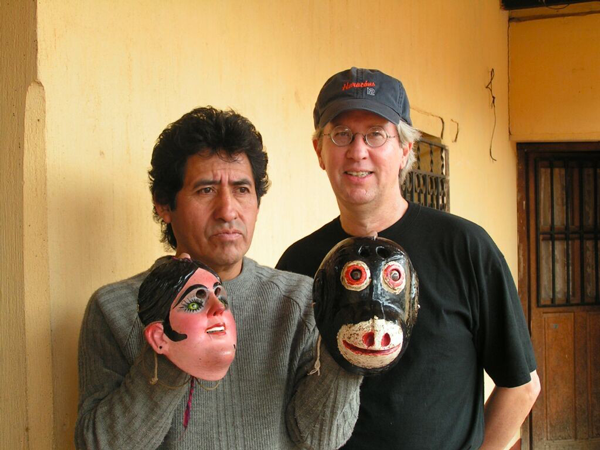 Here is a Mico (monkey) mask from Chichicastenago that was purchased from Luis Ricardo Ignacio by my late friend and fellow collector, Gary Collison. This photo is courtesy of Gary and Linda Collison, and includes Gary, Luis Ricardo Ignacio, the Mico mask, and another mask of a woman who was the Wife of the Deer Hunter. Luis Ricardo Ignacio is the nephew of Miguel Ignacio Calel, who was the proprieter of a well-documented morería (mask and costume rental business) in Chichicastenango; his masks were marked on the back with branded letters—MIC. The female mask in the Collison photo bears this mark, but none of the masks that follow in today’s post have morería marks. 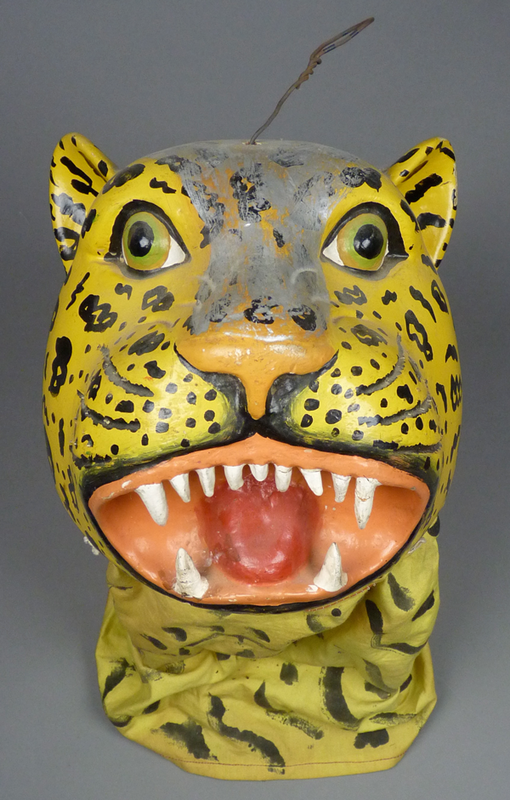 Both masks, along with others with jaguar faces, were said to have been used in La Danza del Venado, the Deer dance. Today I am going to discuss some additional masks from the Mexican state of Chiapas, along with the associated dances. We will examine Tigres (jaguars), Monitos or Changuitos (monkeys), and Toritos (bulls). In related video links you will also see Serpent and Kalalá (also spelled Calala) deer body masks. I will begin with the dance of the Tigres in Suchiapa, Chiapas. Here is one style of Tigre mask found there. It came to me with an original wire that was used to hang the mask from a hook when not in use. It would have been danced without the wire, of course.